Question #1 on my mind when I first saw this advertised is 'Why in the world would anyone want to expend the money on yet another 1/48 P-51?' For the B model itself, there are already three most acceptable kits in 1/48; two of them less than 10 years old. There is the Monogram 1/48 P-51B which was the staple of quarter scale B model builders of several decades. It had raised panel lines and some fit problems, but it was well detailed (especially the cockpit), inexpensive, and found easily. This mold was later ruined (in my opinion) by attempts at adding engraved panel lines for a ProModeler issue. This engraved variant was later reissued as part of the Monogram Classics line. 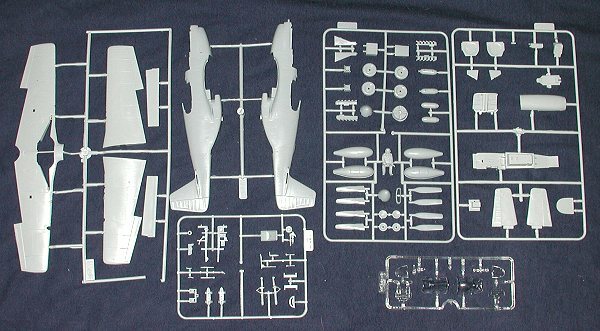 Next, Accurate Miniatures produced several P-51B/C versions as part of the initial production of models. From what I can gather, there were two glitches regarding this kit. One was the cockpit floor and the other was no fairings over the aileron hinges (feel free to correct me if I'm wrong). Otherwise, it was a really super model. The demise of AM has made this kit a bit tougher to locate. Finally, Tamiya produced a P-51B version about the same time it came out with its bubble topped version. I have not built this particular kit, but it looks like a real winner to me. About the only thing I can say about it is that I feel the detailing to be a bit heavy-handed. 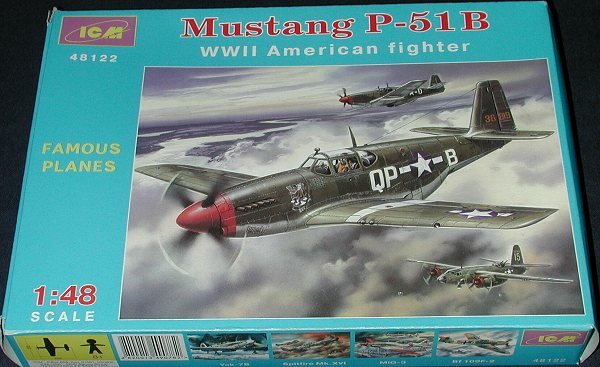 However, if it is engineered like the P-51D, then it is a model that practically falls together. Now we come to the ICM kit. Those of you who follow the history of model companies know that ICM has produced some really super kits. The line of Yak fighters comes to mind. They have also stumbled a bit. Their Spit IX kits were just as superbly detailed as the Yaks, but quality control failed them miserably on the initial production runs and caused the company much negative press. Those problems have been corrected for the most part, but it takes time to get rid of bad publicity. In my Navy days we used to say that 10 'atta-boys' can be wiped out with one 'aw-sh*t', and the early Spits were the 'aw-sh*t'. First thing you notice when you open the box is that the bag is bulging with medium grey sprues. Literally, as mine has split open a bit. There are five regular and one clear sprue. It is obvious from the breakdown of parts that many variants have been planned. Basically there are the wing and fuselage sprues for the specific type with the other sprues having the bits to fill in the gaps, so to speak. For instance there are uncuffed props that won't be used on the B and there are also extra exhausts without the heat shield, and two spinner caps; one short and the other longer as well as different wheel inserts. Optional parts are bomb racks, pilot's seats, flattened wheels, drop tanks, and canopies. One of the optional canopies is a Malcolm Hood used on a number of US and RAF Mustangs. There are also two different instrument panels, so it is obvious that someone has done their homework on this one. The flaps are separate as well so you can display them up or drooped down. The overall detail level is really superb with well done engraved panel lines and equally nicely done fasteners with, where applicable, rivets and other raised surfaces. The overall effect is of a toned-down Tamiya kit, and judging from the way some of the parts are affixed, it seems they have followed Tamiya's example in several assemblies. Unlike most main-stream kits, there are no alignment pins so having parts out of alignment because of these won't be an issue. For me, one way to tell how well a kit is engineered is to check to see how the ejector pin marks are handled. With this ICM kit, the vast majority are in locations that will not be seen once the kit is built. Those that you do see, like on the landing gear, are small and will probably be hidden by the gear doors. Now on to the biggest test of this kit. The Spitfires were marred by having a LOT of very deep sink marks. In fact, on the early runs of that kit, everywhere you had a substantial amount of plastic, you had a sink mark. This was particularly true on the fuselage opposite where stringer and other interior detail was present. On this kit, there are also some sink marks in these areas, however, the extent is no where near as bad and should be easy to fix. These are pretty well confined to the fuselage, tailplanes, flaps and the landing gear doors. Since the tailplanes and flaps are very thick pieces, this is why they are susceptible. One flap in particular is pretty bad so we'll have to see how construction goes as far as hiding it. Instructions for the kit are excellent, giving the builder all the information needed to do a super job on the kit itself. A full range of colors are given and though no FS 595 references are provided, there is a Humbrol match for those who need it. Fortunately, Humbrol paints are available rather easily either in well stocked hobby shops or via mail order. There are two markings options provided in the kit. One is Duane Beeson's OD over Neutral Grey aircraft from when he was the CO of 334 FS in early 1944. The white wing stripes will have to be painted, which is really a much better alternative than decals. These markings are shown on the box itself. In with the instructions are the directions for Lt Whisner's 'Princess Elizabeth' of the 487th FS in May of 1944. This plane is in overall natural metal with aluminum painted wings. The blue nose and black wing and tailplane markings will also have to be painted. 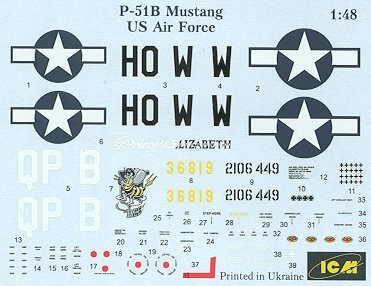 The decal sheet itself is very well printed with all markings quite legible. The decals themselves are quite matte with much reduced carrier film over earlier sheets. I used ICM kit decals with my Yak-9 and was quite pleased with their performance so these should be no different. Bottom line; is this kit going to be worth the effort to buy and build. I'd have to say yes. It has the benefit of being less expensive than the Tamiya kit that is currently out there. In reference to the Monogram kit, it is much more detailed and probably much easier to build. This is a kit that looks like it will do quite well, and one that has jumped near the top of my 'to build' pile. Stay tuned.